- You’ll find Wicked Shipping Fleet Lockup to the south of Sanctuary, not far from the western boundary of the map. If you found Abernathy Farm, look to the west - the Fleet Lockup is within sight of it. - The Fleet Lockup looks to be in decent condition from the front gate, but there are numerous holes in the fence surrounding the Lockup. Use whatever way in you like - so long as you keep in mind that Feral Ghouls seem to enjoy wandering up and trying to nibble on you. Watch out for ‘em. - Out front of the Fleet Lockup is a Protectron unit with a terminal. 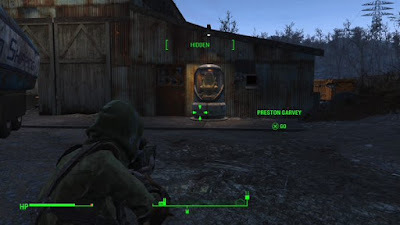 If you can perform a Novice hack on the terminal you can activate the Protectron, providing a bit of a distraction to any Feral Ghouls that might try to bother you on the premises. Beside the terminal is a door; inside you’ll find a toolbox with some items you can break down for parts, as well as a Chemistry Station. - Also out front of the Fleet Lockup is a transport truck, and it has an Expert lock on its trailer. Pop it open to find two boxes full of goodies. One of them can contain an item for Scribe Haylen if you're on a Quartermastery quest for her. - Attached to the left side of the main warehouse is a small office. Inside you'll find an issue of Grognak the Barbarian, a Wicked Shipping Trailer Key - this key can open the rear of that trailer outside, if you aren't an Expert - and a terminal. The terminal provides map locations for the General Atomics Factory, the Corvega Assembly Plant, and the Mass Fusion building. - When you enter the next door over, into the rest of the warehouse, you’ll find a Feral Ghoul Roamer. It needs time to crawl out of hiding; use this to V.A.T.S. it into oblivion. Near its drop point are stairs, though before you go up, pass under the stairs and head right to find a toolbox with some ammo and crafting stuff. - The stairs will take you to the roof, where you can pass over to an adjacent building. Before doing that, walk along the roof to find another hole in the warehouse. 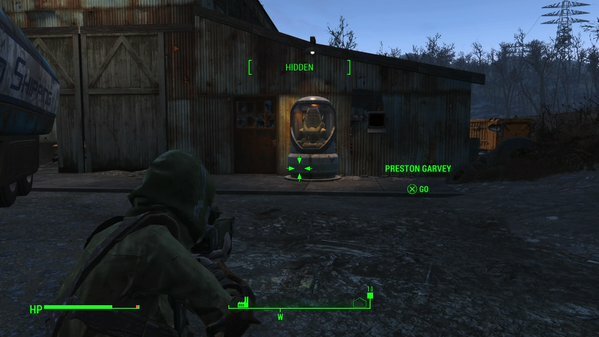 Inside, along with a corpse, you’ll find an ammo box. That done, hop onto the roof of the adjacent shed and you’ll find a corpse up top with a bag full of Pre-War Money. If you have a companion you’re also likely to bring the Feral Ghoul in the building at your feet out of hiding; kill it off. - Drop to the ground. Most of what you’ll find in the shed is crafting material, though beside the radio you can find the Wicked Business Holo Tape. Pop back outside, then look in the truck between the two sheds. Though it looks like it’s full of useless crates, you’ll find a Novice locked safe in the back. It contains a bunch of ammo and some more Pre-War Money. Not quite associated, but close enough. If you cross the water to the north of Wicked Shipping Fleet Lockup and wander a ways northwest you'll find a small house in the woods, the Ranger Cabin. Populated by annoying (but quite killable) Bloatflies, this tiny place has two things of note. First, you'll find a copy of the Wasteland Survival Guide on the desk, which is always nice. Second, there's a body inside, and beside it a suitcase. Check the suitcase to find the Runaway's Holotape, among other things.